Apr. 2 (NBD) -- Apple has cut prices for iPhones, iPads, Mac and other important products, according to price changes made on Apple's online store in China on Monday. Apple's Tmall flagship store recorded 310 percent increase in sales on Tuesday compared with the day before. The iPhone XR now starts at 6,199 yuan (923 U.S. dollars) on Apple's online store in China, nearly five percent lower than its previous 6,499 yuan price tag. The higher-end iPhone XS and iPhone XS Max models each received a 500 yuan price cut as well and now start at 8,199 yuan and 9,099 yuan, respectively. 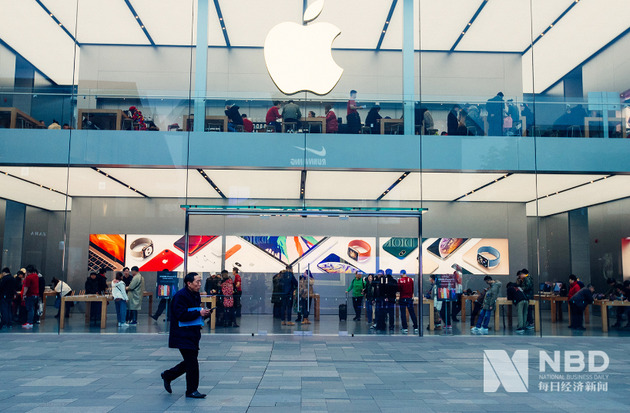 The price cuts were in direct response to a tax change in China which lowered the value-added tax for manufacturers like Apple as well as for transportation, construction and agricultural sectors, the 21st Century Business Herald reported citing industry insiders. The tax cut went into effect on Monday. According to Apple's customer service, customers who bought an affected product from Apple in China within the past 14 days can receive a refund for the difference in price. The major revenue contributor for Apple, iPhone sales affect directly the financial results of the smartphone maker. In January this year, the iPhone maker issued a rare earnings warning and the financial results for the fourth quarter of 2018 released later showed a sharp 15-percent drop in iPhone sales and a year-on-year revenue decline of 27 percent in the Greater China region. Statistics compiled by International Data Corporation showed that iPhone shipments in the fourth quarter of 2018 dipped by 11.5 percent, well above the 4.9 percent decline in global smartphone shipments. In addition to measures like price cuts, the GiveBack plan and interest-free financing aimed to boost waning iPhone sales, Apple has also been cast about ways to beef up its services business, for example, launching credit card, News Plus subscription service as well as video-streaming service. But, the promise of such non-iPhone business remains unknown at the current stage. Apart from "fewer iPhone upgrades", Apple is also caught in price dogfights with Huawei, Xiaomi, Samsung and other smartphone brands which release increasingly higher-end products or lower product prices to grab the market share. However, domestic smartphone manufacturers largely depend on quick turnover, with profits lagging greatly behind Apple's. According to Counterpoint Research, Apple earned 62 percent of the global phone profits in the second quarter of 2018. Therefore, iPhone models with lower price tag would bring about fiercer price competition for Chinese phone makers.